Test Only provides less information than HealthPrint, but still features the same high-quality blood tests common in all of our services. 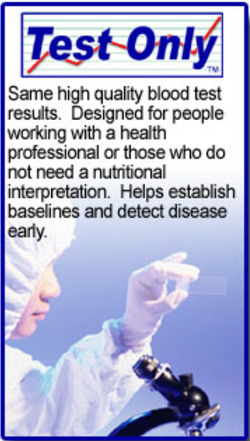 Test Only is designed for people working with a health professional or those individuals who do not need customized nutrition analysis. You receive the test results directly from YFH – your doctor does not need to order the tests or release the results to you. 4. Their doctor wants our more accurate test protocols. For example, we use glass tubes for specific tests that other labs will not use due to cost containment. We also do "difficult to collect" samples that require more instruction to the drawsite and closer follow up on shipment. Each time you test in Test Only, you will receive a copy of the Official Lab Results and a Personal Normal Tracker (PN Tracker), which will show you all of your blood test history since you began testing with us. This history report is useful for catching health problems before symptoms develop and is a very useful and important tool for your health professional. Our free conferences are not included in this test program as it is expected that you will work with your own professional who will explain the tests. We do, however, provide our book "Normal Blood Test Scores Aren't Good Enough!" to help you understand your tests. You may also visit our test explained pages on our website.